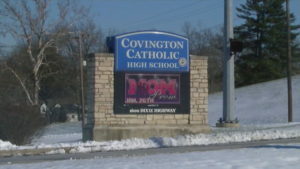 COVINGTON, Ky. — A Kentucky boys’ school shut down its campus on Tuesday as a precaution and a small protest was held outside their diocese as fallout continued over an encounter involving white teenagers, Native American marchers and a black religious sect outside the Lincoln Memorial last week. Longer videos from wider perspectives emerged later over the Martin Luther King holiday weekend. They revealed that the drummer — Omaha Nation elder Nathan Phillips — had intervened between the boys and the religious sect, at a moment when the teens seemed to be getting rowdier, and the black street preacher who had been shouting racist statements against both groups was escalating his rhetoric. Soon, all sides were pointing fingers, speaking their own truths about feeling victimized and misunderstood. “We just don’t know what the volatility of the situation is with these people that react and they don’t know the full story. And it’s very scary,” Jill Hamlin of Cincinnati, who was there to chaperone as the boys attended an anti-abortion rally, told FOX News Tuesday morning. Phillips, for his part, offered Tuesday to come to the boys’ campus and join with them in a dialogue about cultural appropriation, racism and the importance of listening to and respecting diverse cultures. The diocese, which issued a weekend statement criticizing the boys’ behavior, was unavailable for comment Tuesday morning. Both the school and the diocese websites were taken offline. Left: Entrance to Covington Catholic High School in Park Hills, Ky. Photo by WCPO.